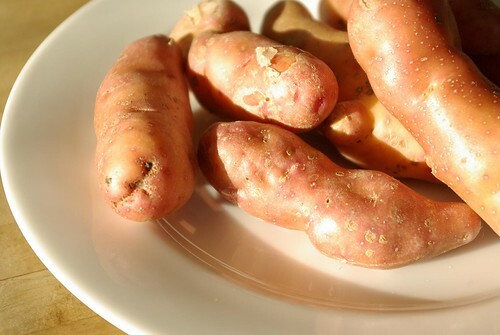 We found these gorgeous pink fingerling potatoes at the farmer’s market last week, and couldn’t resist. I realized as I was taking their picture that they’re actually kinda fleshy looking, so it’s just as well they lost their color after cooking. 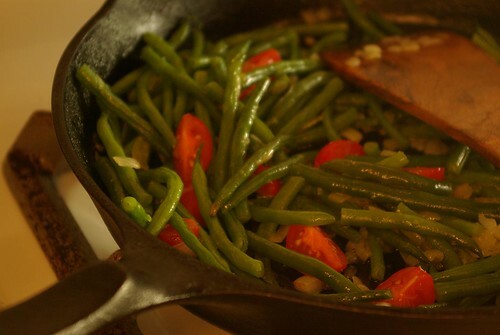 They were good, though – I halved them lengthwise, tossed them with olive oil and Marlunghe herbed sea salt (thanks, R&G! ), and roasted them at 400° for about half an hour. They were crispy and salty on the outside, chewy and sweet on the inside, with a hint of savor from the sage and rosemary in the salt. 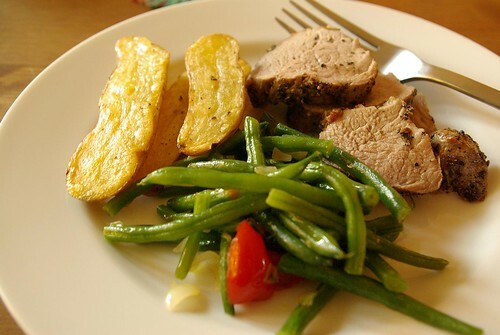 Potatoes like that need some good accompaniments, so Jon roasted a pork tenderloin and made a exceptionally yummy pan sauce with white wine, butter and reduced apple cider, and I tossed some blanched green beans into a pan with minced shallot and a few fresh tomatoes. It was very, very, very good.